Daniel MacPherson perfectly remembers the moment he decided to change the course of his acting career. That was the question that led MacPherson to the biggest role of his life: starring on the Cinemax action series Strike Back, which premiered on Friday, February 2nd at 10 p.m.
A self-described “overweight kid,” MacPherson played rugby and was bullied in school, but when he first started doing triathlons, everything clicked into place. Since he was a teen, the now-37-year-old MacPherson had been competing and training for triathlons. 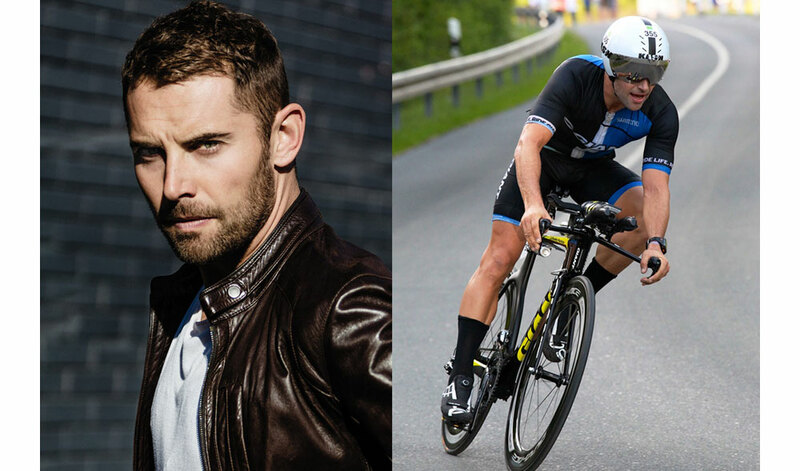 In fact, when he was growing up, MacPherson didn’t have dreams of becoming an actor—he wanted to be a professional triathlete. After being discovered by an acting manager at 16 while competing in a race, MacPherson put together a successful career in his native Australia, starring in a number of stage productions, television, and film projects, including the long-running Australian soap Neighbours, the police drama City Homicide, and hosting gigs on The X Factor and Dancing With the Stars. But MacPherson left that behind when he moved to Los Angeles, following a generation of Australian actors who made the successful jump to Hollywood—like MacPherson’s pal Chris Hemsworth, workout buddy Luke Hemsworth, Liam Hemsworth, Jai Courtney, Luke Bracey, Simon Baker, and, of course, superstars like Hugh Jackman and Russell Crowe. But for all his success in Oz, something was holding him back in America. While MacPherson was getting auditions for what he called “big roles in big productions”—lots of tryouts as soldiers, FBI agents, and military operatives—he kept finishing in second or third. MacPherson had been spending 20-25 hours per week training and focusing on his triathlon work, but following that fateful Ironman race in Germany, he poured his energy into transforming his body to fit those auditions. Consider the transition a success. Following his physical change, MacPherson quickly booked roles on MTV’s The Shannara Chronicles, and the FOX series APB, both of which eventually were canceled. But MacPherson’s fitness transformation led him to getting his biggest American role: playing Sergeant Samuel Wyatt on Cinemax’s Strike Back, a high-octane action-drama featuring special forces missions around the world. MacPherson added even more muscle to his frame to get into character, putting on another 15-20lbs while focusing on his shoulders, chest, and back to get as “thick” as real-life Navy SEALs and commandos he met while doing research. MacPherson built his foundation with deadlifts and squats so he could move like his real-life character would while carrying 30–40lbs of equipment and weaponry. 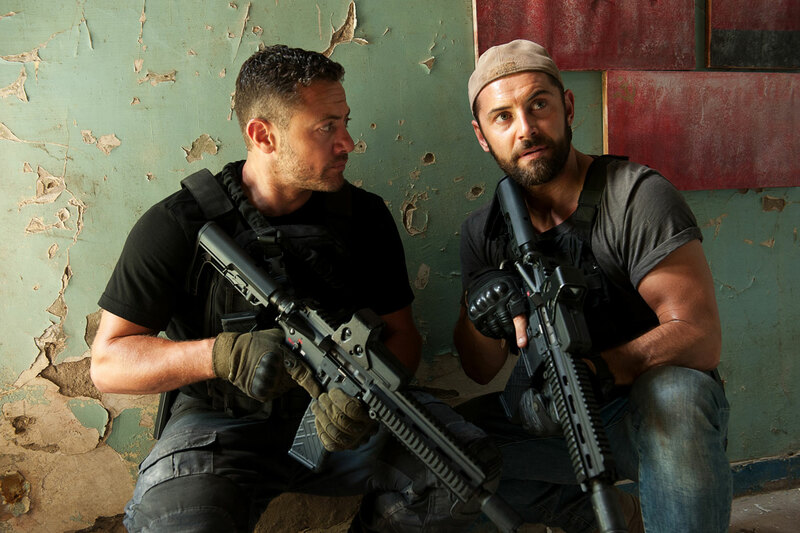 The cast of Strike Back (which also includes former professional Muay Thai fighter Warren Brown), did firearms training at Taran Tactical, where Keanu Reeves trained for John Wick. (“We got to go out on the same range as Keanu,” MacPherson says. “I was pinching myself.”) The cast also trained together in a three-week bootcamp in Jordan, where some of the show was filmed. MacPherson and the actors lifted weights in the morning, followed by an hour of jiu-jitsu, and then rock climbing. The rest of the day, they trained at the state-of-the-art King Abdullah II Special Operations Training Center alongside Jordanian Special Forces. But not even all that training could totally prepare the actors for what they had to do on set. Given that Strike Back portrays adrenaline-soaked military missions, filming called for death-defying stunts—explosions, gunfights, and close-quarters combat—and almost all of it was done without CGI assistance. The Jeep stunt was just a warmup. Through the course of the season, MacPherson jumped off buildings, jumped out of helicopters, ran out of explosions, and he even drove a speed boat, too. Clearly, MacPherson survived the production, and his work on Strike Back has already gained him notice in Hollywood. MacPherson will appear in Disney’s $100 million epic adaptation of A Wrinkle in Time coming out in March, and he has a few other projects lined up, too. Perhaps his new physicality could lead to the actor stepping into a genre in which fellow Australians have had success: superhero films. With his friend Hemsworth starring as Thor in the Marvel films, and fellow Aussie Hugh Jackman hanging up his Wolverine claws, it’s worth asking: How would MacPherson feel about taking over as the bearded, cigar-chomping X-Men hero? MacPherson’s already working on that training. The actor’s been keeping up with the workout regimen that helped him get Strike Back in the first place, and he’s hoping that he’ll get to step into Wyatt’s shoes again for a second season. Strike Back: Retribution premiered Friday, February 2nd on CINEMAX at 10 p.m. and is available on-demand.